Vancouver, BC - Aurelius Minerals Inc. (TSX.V: AUL) (the “Company” or “Aurelius”) is pleased to announce that drilling has commenced on its Mikwam Property. The minimum 2,500 metre drill program aims to expand the extents of the Company’s Mikwam Deposit and to test 4 new targets on the Property. The initial hole is located at the Western Target, approximately 2 kilometres along trend and to the west of the Mikwam Deposit (see Figure 1 below). 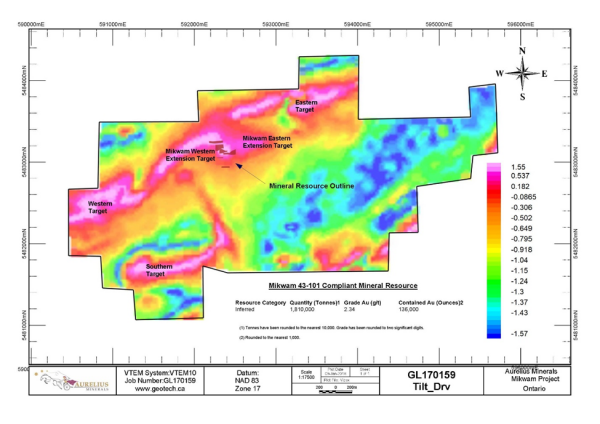 The target is on trend with the Mikwam Deposit and has a similar geophysical and structural signature. The Company recently announced that it received a portion of the extensive high resolution (100 metre line spacing) VTEM survey which Detour commissioned over their Burntbush Property. The Burntbush Property completely surrounds the Mikwam Property. The Mikwam Property contains the only inferred mineral resource of 1,810,000 tonnes grading 2.34 g/t estimated in accordance with NI 43-101 in the region. Covering the Mikwam Deposit provides a unique opportunity to define a signature for exploration for additional gold deposits on the Property. The Company intends to conduct $1.5mm of exploration on its portfolio of assets in Ontario. This will comprise approximately 5,500 metres of diamond drilling on both the Lipton and Mikwam properties. The minimum 2,500 metre 2018 Phase 1 drill program has commenced on Mikwam and will test continuity of mineralization on the east and west extensions of the current resource, as well as test the southern anomaly highlighted in the 2017 VTEM survey. The 2018 Phase 2 drill program will test both the Lipton Gold Zone and five distinct locations at the Lipton North target where prominent regional structures are interpreted to cross-cut the anomaly. We expect to drill approximately 3,000 metres on Lipton during Phase 2.